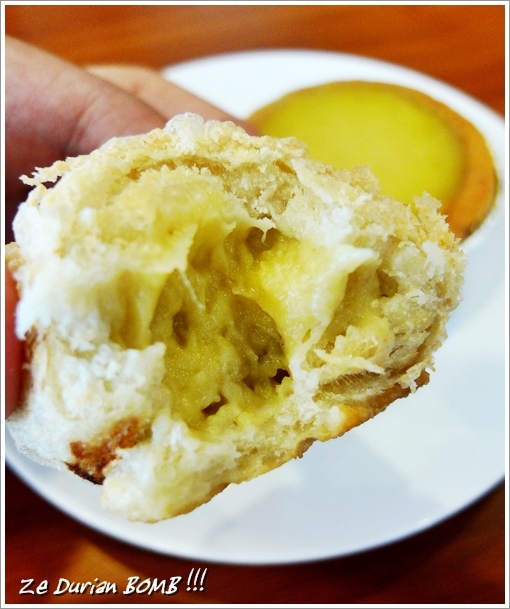 DURIAN – Thorny, pungent, repulsive, sweet, creamy, addictive, impulsive, offensive, formidable …. whichever adjective you choose to brand them, the KING of FRUITS shall not be dethroned anytime soon. We are in the midst of the durian season (June-August) here in Malaysia, and yet I have NOT touched a single seed until now, and probably won’t be maiming the delectably sweet, ‘fragrant’, creamy and rich flesh anytime soon. Some lamented that the rainy season destroyed the prospect of getting good harvest this season. 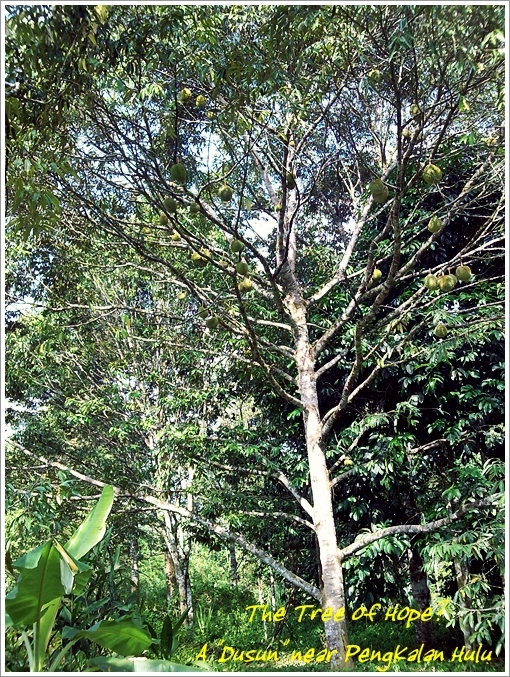 Even in areas densely packed with durian trees (they grow in their natural habitat; mostly in orchards or ‘dusun’ in the rural areas, though cultivation of durian is more and more common now), the produce ain’t satisfactory yet. Maybe the durian boom will be a little late this year – I can only cross my fingers. Are You Salivating yet?! OR … have you fainted from the sight or the imaginary whiff? 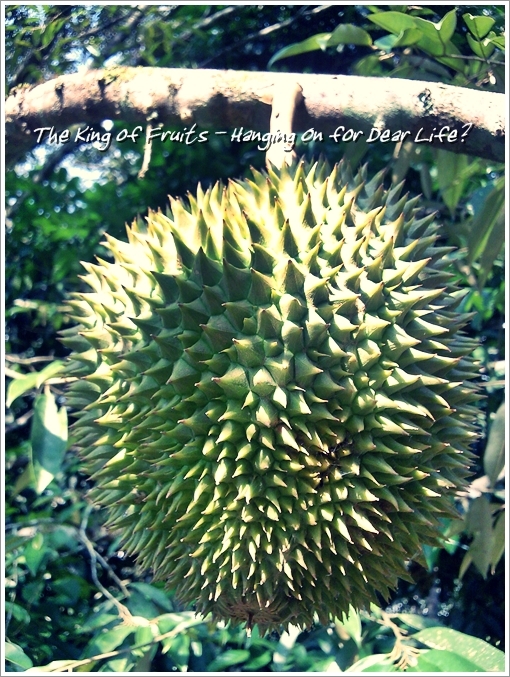 All the pictures in this post were taken prior to the 2010 durian season. I scavenged, cracked my head, and dug deep into the archives; all the while drooling incessantly. From a formidable, most mysterious fruit (they’re even banned in hotels and elevators!) with a thorny husk and a pungent aroma, durians have been used extensively in various culinary delights such as beverages, desserts and even savoury dishes. So strap yourself in, and join me for a ride on the journey to commemorate the fruit so-deservedly crowned; The KING Of Fruits …..
Best venue to enjoy your durians? In the ‘dusun’ (orchard) where the trees are !!! Back in 2008, we embarked on a short excursion to Pengkalan Hulu, the northern-most town of Perak state that shares a border with Betong of Thailand. On the way up north, we went on a detour to a fruit orchard that belonged to the late father of a colleague’s. Suffice to say, we went crazy relishing the seemingly-unlimited supply of fresh fruits (yes, some were even plucked from the trees! ), all the while seeking respite from the heat underneath the shady foliage from above. Of course, the durians were gathered prior to the feast. We can’t be sacrificing our pretty (log)heads standing around in hopes of the hazardously thorny fruits to fall on us! That’s plain suicidal !!! Anyway, to please the ones who are not blessed with a high threshold for the fresh, pulp-ish custard from the durian seeds, try adapting to the various types of durian desserts available almost everywhere now. The stench (or fragrance) is minimized indefinitely, and the sweet, sultry desserts may even leave you hankering for more …. perhaps, the REAL DEAL in the near future? 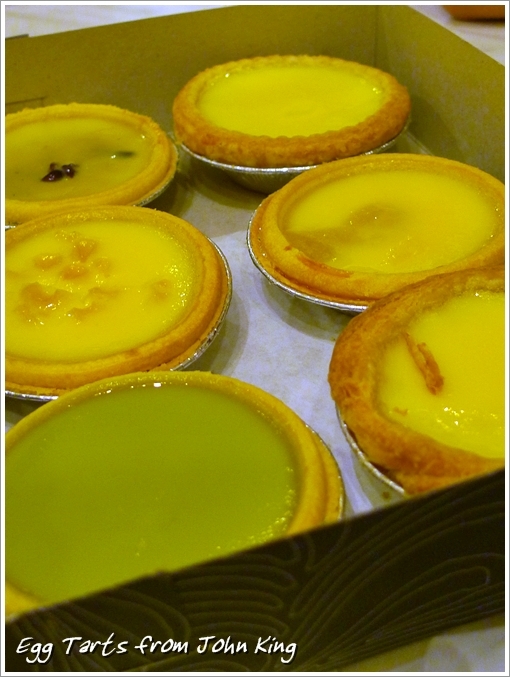 Many places offer durian egg tarts nowadays, from the casual confectioneries to slightly upmarket brands like John King. First opened at Pavilion in Kuala Lumpur, the egg tarts reminisced of Hong Kong’s tarts, with cookie pastries instead of the flaky version in dim sum outlets here. Must try? The DURIAN flavour, at about 20 cents (MYR) more than the others. Well worth the price, really. The milk and original flavours are equally good, but the others not as tempting. I was introduced to these babies back when I first started my food crawl in Kuala Lumpur, when I barely started to write at Motormouth From Ipoh. Best to be refrigerated and eaten as soon as possible, I faced a slight mishap on an occasion when I left them in my car for a few hours, and ended up sniffling on stale durian paste. Grrrr …….. 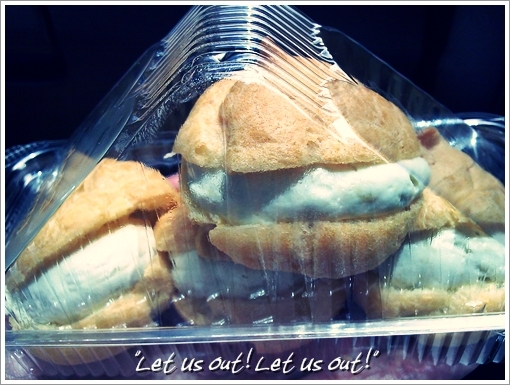 But for that irresistible price tag (back in 2008, they were sold at RM2.40/USD0.70 for FOUR pieces), you get top quality cream puffs with a refreshing and not artificial tinge of durian. Still the BEST Durian Pancake for me; Lee Lee’s Sumptuous Desserts kiosks (The Gardens, Ikano Power Centre, and Sungei Wang Plaza) sell them at RM10/USD3 for 6 pieces. If you think that smelly fingers are inevitable after a durian wallop session, THINK AGAIN. Still, NOTHING beats the REAL DEAL. Myths have surfaced over the years: To drink some water from the emptied husk to reduce the ‘heat’ from the fruits, and to wash one’s hand in the same manner to eliminate the unpleasant aroma. 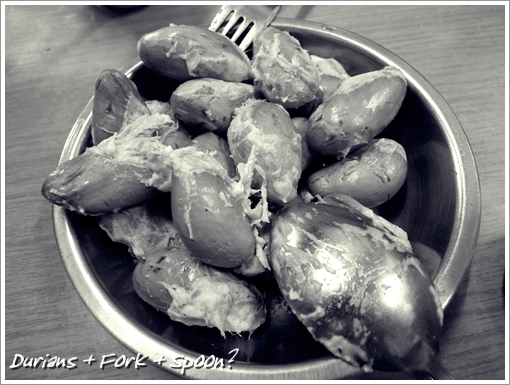 But have you ever thought about eating durians with FORK and SPOON, or any other utensils? If you think that’s ridiculous or impossible, think again. I have a friend who is an ardent fan of the fruits, and yet all these years she had somehow managed to avoid using her bare hands to manipulate the seeds. Beats me to what extent she cried, begged, or hunted for the cutlery every single time …. but that’s an inviting thought for hygiene freaks who can’t stand having their fingers smelling of durian. Weapons of Mass Destruction? Nah …… we were Durian-ized BIG TIME at Changkat Lada in Perak, back in 2008. Remember I lambasted critically on the proposed excursion to Changkat Lada last week? I survived the ordeal. Gracefully, I might add. 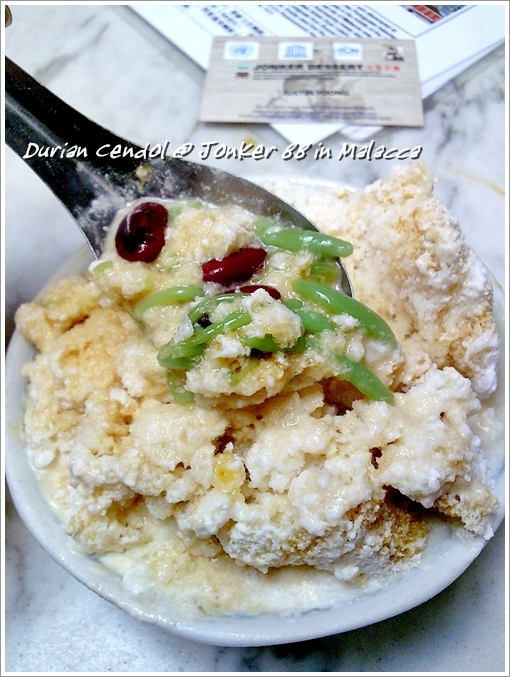 Owing to the anticipation of a Major Durian Feast (we had the fruits AND a creamy concoction named Pengat/Bubur Durian with Roti Jala and Pulut back in 2008! ), we persevered and revelled in the thoughts of licking our fingers clean from the creamy, yellowish custard ……..
To which we were only served with roti jala (“net bread” – get the recipe from Rasa Malaysia here) and the cloyingly sweet and creamy pengat durian (a sweet concoction made from coconut milk and durian flesh). No REAL fruit in sight, sadly. But this may prove to be a blessing in disguise, for at least I saved the best for last? The season seems to be still booming, though nary a durian is in sight at home. I have gone MAD !!! The craving was intense I tell you ……. I’ll get my hands on some very soon …. your pictures make me wanna eat durians badly now! 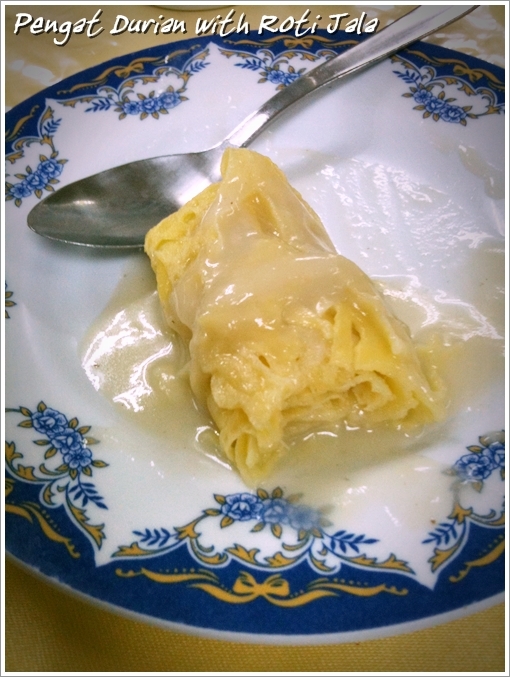 I just ate kampung durian from KK last week. Sold by a malay chap at Pasir Putih. I must say the durian is damn good cause those I picked are just ripe..My only complain is it got only about 5-6 seed inside. Not enuf to eat…..
Small ones lah? Some swear by the smaller the durians, the better. I have tasted real, kampung-quality durians for free before. A colleague brought from his own dusun. Hi! I love durian you make me wanting to look for durian now. I always go for the BITTER species…yumm yummm but always difficult to get it becos sometimes the seller is unable to confirm unless he knows the durian type or he is the owner of the durian tree. 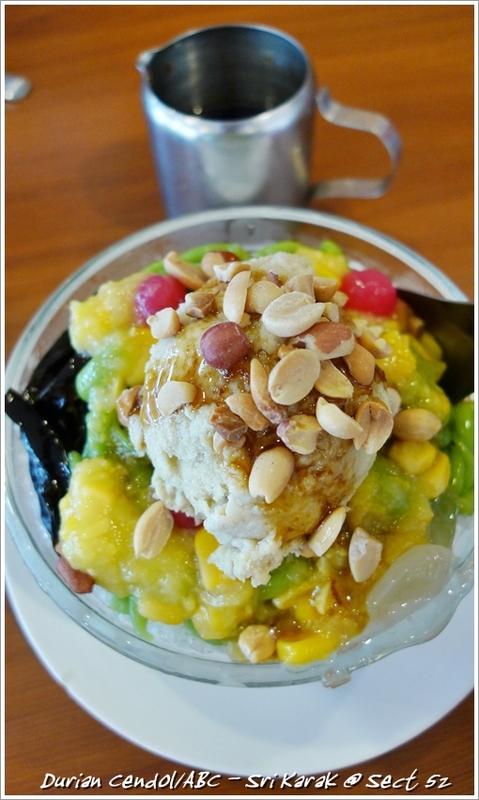 Then the Musang wong..wow.. simply delicious and pricey which my family loves and it is a thorn to my pocket. Bitter one ah? Depends lah, sometimes the bitter one tastes a little ‘kelat’ …. hard to accept. I love those reddish/orange-coloured ones. Dense, creamy and sweet. I am going to the durian orchard soon….looking forward leh….! Awsome ! Durian is my favourite fruit, people said Malaysian durian are way better than Thailand one. Personally, I think Thailand’s durians are bland! Without even the putrid (aromatic?) smell …… I’d go for Malaysia’s produce anyday. Thailand’s Durian are very big and thick with flesh! But then, they are less aromatic and creamy compared to Malaysia’s. oh durian. I have been OD on durian these 2 weeks o_O dad bought alot for me..and apparently. my dad used to own a durian orchard and we had endless supply, but now we had to buy to satisfy our cravings. Wah … sold off the orchard already ah? I have always missed the early days when we used to binge on durians in Sungkai, picking on those with squirrels’ bite marks. Those tend to be the better ones. 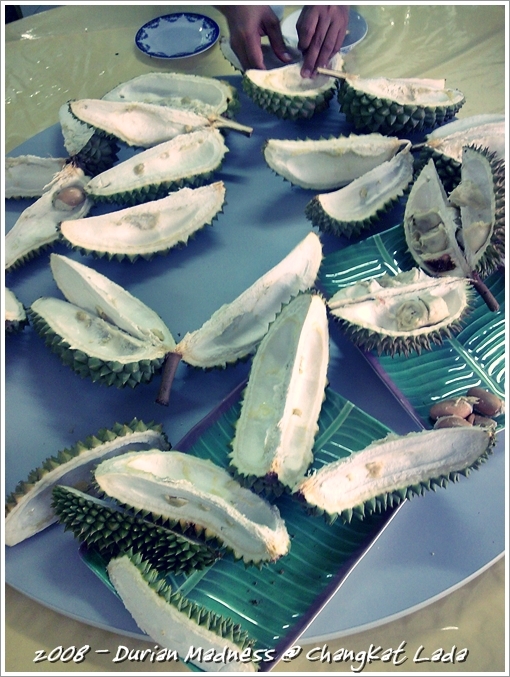 I wonder if there’s a durian buffet here in Ipoh … or nearer to Ipoh. I saw many durian stands in KL. Hello!!! Hahaha …. finally seeing you here. Pengkalan Hulu?!!! Ahem …. let’s give that a miss til it’s really really necessary shall we? Its that time of the year again! Lol….. time to eat drink sleep durian. Hi thana, not sure about this. But you certainly can buy durians from most roadside stalls (and even shops) when they’re still in season now. 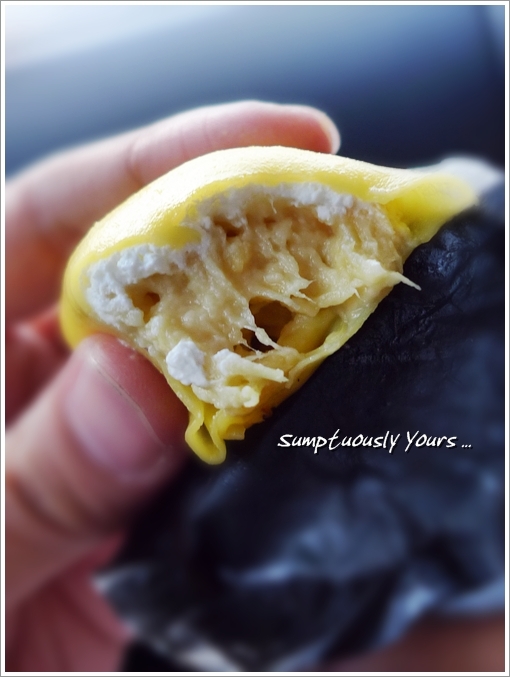 Have you made an authentic Durian ‘Soft-serve’ using nothing but Durian??? Here’s how: Open a durian, take out the seeds, freeze the remaining fruit. When frozen, cut up the pieces as best you can then put them into a Food Processor. Pulse the switch off and on often. You will be making the nicest Durian Soft-serve you have ever eaten. I am looking forward to the the day when I can freeze a ‘fresh Durian’ and try it instead of using the ones we get here in the US which are several weeks old. P.S. Works good for bananas,mangos etc. as well. 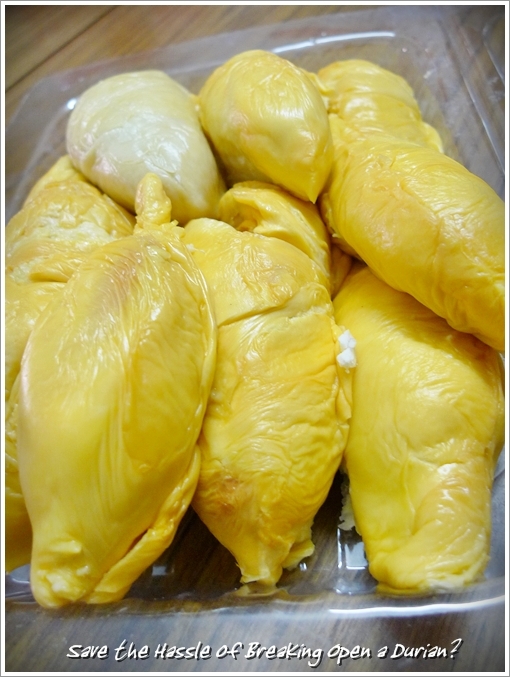 You are killing me with the durian picture….. Can I still get durian in July? Can. I thikn the season is starting soon. I hope. Durian lover,Everybody loves durian.king of the fruit……i ve read in one article alady planted 300 musang king trees near gua musang.she collected RM 300k per seasion.price per kilo is reaching rm 25. Just imagine if we are one of them who had planted the tree.so when are we going to plant wthis musang king.